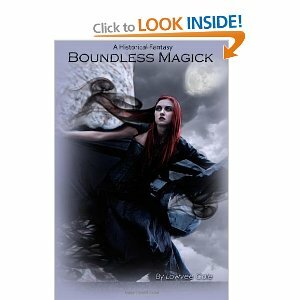 BOOK REVIEW -BOUNDLESS MAGICK BY LOWVEE COLE | supermum ......... wheres my cape ??? supermum ……… wheres my cape ??? SEVENTEEN YEAR OLD ABIGAIL STONE LIVES IN EXILE ON PRESENT DAY BLOCK ISLAND,MAGICALLY BINDED BECAUSE OF HER FAMILYS UNSEEMLY PAST.BUT,ONE NIGHT ,DURING A FREAK STABLE ACCIDENT,HER POWERS MYSTERIOUSLY RETURN . ABIGAIL HAS ENOUGH TROUBLE GRASPING THE IDEA THAT SHE CAN SUDDENLY MAKE MAGIC.SHE DOESNT NEED THE ADDED COMPLICATION OF FACING CAPITAL PUNISHMENT FOR SEVERING A COUNCIL -ENFORCED BIND.LUCKILY ,THE COUNCIL AGREES TO SPARE HER LIFE .HOWEVER,THEY CANNOT IGNORE THE DARK AND DANGERUS FORCE SHE HAS SPAWNED IN THEIR WORLD WITH HER CRIME.THEY ORDER ABIGAIL THE SIXTEENTH-CENTURY WICCAN KINGDOM OF ADEHYA.THERE,THEY SECRETLY TRAIN HER TO DEFEAT THE EVIL SHE CONJURED,WHICH NOW THREATENS TO CONSUME THE COSMOS. THE COUNCILS PLAN IS SHATTERED HEN ABIGAIL FALLS FOR AN OFF LIMITS PRINCE.THEIR FORBIDDEN ROMANCE LEAVES ABIGAIL AT THE MERCY OF THE ONLY ENTITY THAT CAN HELP HER FULFILL HER DESTINY :A VENGEFUL WICCAN GODDESS WHO WANTS ABIGAIL DEAD . I was sent a copy to review from the author so thank you for giving me that oppornity. Its different from what I would normally choose to read but I believe as a avid reader its important to read a variety of genres. This is the authors first book and I think considering this the book is brilliant and captivating. I really felt like I was transported to another world of magic, spells ,love and history. The book is aimed for young adult but as a 31 year old mum I found it still enough to keep me turning the pages . There were some parts I found difficult to stay focused on but im going to put this down to it being not my typical read. Overall a exciting tale and look forward to seeing the success of this debut author .